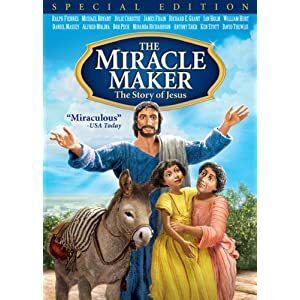 We watched The Miracle Maker one year during Spiritual Emphasis week (I think) when I was at Canadian Bible College, and I remember being blown away how an elementary-oriented movie using mostly claymation could carry such power, and convey the story with such truth. Jesus' story truly is the Good News, and no matter how you share it the Spirit will move in power and love that you cannot deny! I was watching this movie a bit today with my almost 5 year old, and felt the need to skip some parts of it (mostly the stuff involving "Mad Mary" - their take on Mary Magdalene). I think it would really connect with kids in Grade 3 (maybe grade 2 as well) to Grade 6. It tells the story of Jesus' life and ministry, with flashbacks to his birth. I love that it is told in relation to the friendships he built, and the people he healed. Check out the review below done by Christianity Today. Shown in theatres in Europe and on television in North America, this follow-up to the Welsh-Russian TV series Testament: The Bible in Animation was the first major animated cartoon about the life of Jesus. Like the series that preceded it, The Miracle Maker employs a mix of animation techniques, and in a very purposeful way. The day-to-day experiences of Jesus and his followers are depicted with stop-motion puppets, while the parables, flashbacks, memories and spiritual encounters are depicted the traditional, hand-drawn way; the scene in which Jesus casts the demons out of Mary Magdalene is especially striking, as it segues from one style of animation to the other. Co-produced by Mel Gibson's Icon Productions and written by Christian author Murray Watts, the film stars the voice of Ralph Fiennes, whose Jesus is by turns tender, humorous, exasperated, and above all very, very engaging. I remember watching that movie at CBC too (must have been at the same time;)). Great movie and I've used it in ministry for the older kids! I have it in a box somewhere! Good movie!